Uses : The roots are acrid, bitter, astringent, sweet, emollient. 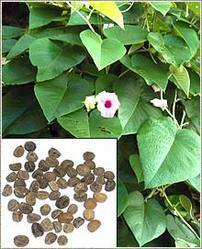 It is used in vitiated conditions kapha and vita, emaciation, wounds, ulcers, anorexia, dyspepsia, flatulence. It is widely used for Psychotropic and ornamental purposes. The seeds of Argyreia nervosa contain about 0.3% ergot alkaloids, including chanoclavine, lysergol, ergotmetrine and ergine. These are all derivatives of Lysergic acid and most are collectively named lysergic acid amides (LSA). (Lysergic Acid Diiethylamide) is also a lysergic acid amide and although resembling the natural lysergic acid amides both in structure and and pharmacological activity, it has not been found in nature. Many of the ergot alkaloids can cause constriction of bloodvessels, which may result in necrosis of the tissue and gangrene in humans and animals. Roots are used in the treatment of gonorrhea, rheumatism and diseases of nervous system. It is also used in obesity, hoarseness, syphilis, anaemia, diabetes, tuberculosis and general debility.